Written by the News Team. Student society Liberate the Debate’s most recent event was cancelled over a lack of compliance with the Students’ Union’s (USSU) requirement for a neutral chair – a requirement which has no textual presence in their External Speaker Procedure documents. The Society organised a debate between two prominent YouTubers: ‘Sargon of Akkad’ (real name Carl Benjamin) and ‘Xexizy’ on the topic of free speech. Frida Gustafsson, USSU President, had offered to chair the debate but later withdrew this offer in light of the position of the Union and Sussex students. An alternative chair was then suggested from within University staff on the day of the event. In an email sent from the USSU Officer team to LtD, they said that Sussex students had complained about the event and that significant student concern swayed Ms Gustafsson’s decision to withdraw. USSU said that the majority of complaints had come from people of colour who felt unsafe with the event taking place. The debate was scheduled to take place on campus on April 20th. However, the Students’ Union gave notice of a potential chairing issue only six hours before the event was due to start. In an email sent to the society that morning, USSU officers also recommended the event be cancelled in order to comply with internal diversity, safe space and zero tolerance policies – despite it’s having been previously approved and Mr Benjamin originally not flagged as medium or high risk. Debates and events put on by students in Students' Unions shouldn't be seen as 'risks' to be managed – they are a fundamental part of our existence and purpose! We should be supported, not restricted, in putting on challenging & thoughtful debates and events w/ students. The Badger understands the society rejected the University’s choice of Chair due to a concern over their commitment to free expression in the debate and the topics they would allow for discussion. Liberate the Debate President Peter Anson was then rejected by USSU as the Society’s last suggestion of Chair, on the basis that Mr. Anson has a conflict of interest in a free speech debate due to his role as chair of a free speech society. The dispute which led to cancellation was over the need for a neutral chair to challenge speakers’ views and ensure balanced debate. However, this requirement is not a codified rule within the Union’s external speaker Procedure, Guidance or risk assessment. An LtD response to The Badger claimed that “in our correspondence with the Students’ Union, it was made clear to us that we had full discretion in selecting an appropriate chair, without regard to any vetting which the Students’ Union may deem appropriate.” The policy documents do not state a requirement for a neutral chair even in the case of events flagged as medium-high risk, which Mr Benjamin became in a later risk assessment. Ms McIntosh told The Badger that “there is no current documentation on the requirements for event chairs as the procedure for dealing with external speakers is new and in the past we’ve looked at the specific requirements for each event. Six months ago, The Badger reported that the guidance was ambiguous, as it did not state all regulatory steps which had been used when implementing the policy. USSU said at the time that it would be ‘providing much clearer information’, and adapting the policy if necessary. The event eventually took place off campus at Stanmer Park and a video of the event has been uploaded to LtD’s YouTube channel. A group set up to protest the event handed out leaflets condemning Benjamin’s previous comments. A Facebook group entitled “Yes to Free Speech, No to Bigotry // Counter Sargon Talk” was organised by Sussex – Shutdown Yarl’s Wood, Sussex Friends of Palestine Society, Sussex Cut the Rent, Free Education Sussex, Occupy Sussex and University of Sussex Labour Society. The Badger contacted the group but they did not wish to make a statement. LtD also claims that Anti-fascist protesters were in attendance and that one heckler assaulted an LtD member. Brighton Anti-fascists responded to these allegations by stating: “As far as Brighton Anti-fascists are concerned we did not organise any kind of demonstration against Carl Benjamin’s speech as broadly speaking he is neither a fascist or an ultra-nationalist… we would support anybody who chose to speak out against him, as we understand a number of Sussex students did. “We don’t know enough to comment on any allegations of assault.”. Video footage on LtD’s YouTube channel shows an altercation. The video footage is unclear and we have been unable to identify an instigator. However, a scuffle broke out between audience members and the alleged victim of the assault, with a LtD organiser being shoved from behind after the initial altercation. The debate continued after this altercation was resolved. LtD initially listed the debate on Eventbrite and The Students’ Union website with tickets costing £5 and £3 respectively. The SU offered to cover the cost of cancelling the event. Proceeds from ticket sales were intended to be used to fund security, with ticket holders were advised they would need ID upon entry. This was in order to comply with SU security policies surrounding events and external speakers. However, after the event was cancelled and moved away from campus, security were unable to provided their pre-arranged service. 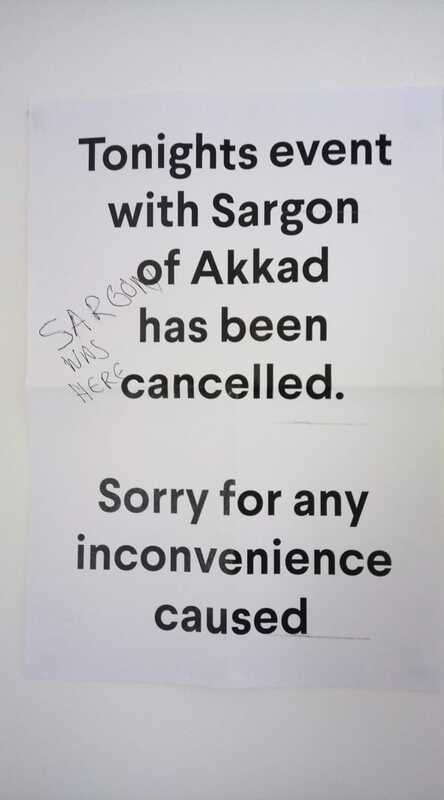 Sargon of Akkad has proven a controversial figure. A talk he attended at King’s College London in March this year saw violent protests. The police were called and the incident was reported on by several national news outlets. You can read the responses from both Students’ Union President Frida Gustafsson and Liberate the Debate’s Edward Seccombe here.